Joining 5 Minute Friday writing for 5 Minutes . . . I think of people. People groups that I want to connect with. I think of God and my desire to be closer to Him and connect. And it is because of the desire that is in my heart that I want to connect with people.
. . . I want to connect with my new coworkers. I want them to see Jesus shine through me.
. . . I want to (re)connect with my daughter. I wish things could be back to they were before she got married. I wish that she had not had to suffer through an abusive marriage. I see her old self peaking through sometimes and I can't wait till she is back and we can connect.
. . . I want both me and Cowboy to connect to the boys that we minister to. I want to help them connect with God. Join Lisa-Jo today and connect. Click here. Do you have a Thankful list today? Here's just a few of the﻿ things on my list today . . . I am Thankful for the trees on our apartment property. Surprisingly there are some really neat trees on our property. There are sweet gum maples, pines and willow trees. They are so pretty to look at. The landscaping is really pretty. It is nice to see all the beautiful trees and plants while I walk Daisy. Most of my neighbors patios are filled with pretty flowers. I am Thankful that it is 8:30 and my kitchen is clean (well almost one pot to wash). The dishwasher is filled. The sink is clean! I am Thankful that I get off work at 4:40. I worked evenings at my last job so it is a blessing to be working days now! 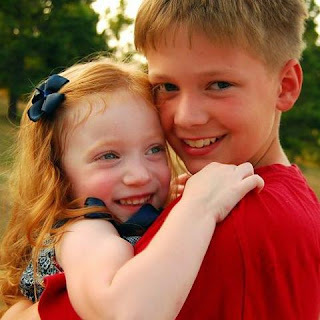 And I am thankful for . . .
. . . my grandkids. I think this is a sweet photo. I am thankful for my job because Cowboy and I are saving 80% of my paycheck for a family vacation. We are planning on giving the kids and grandkids an all expenses paid trip to South Dakota next summer. We are planning on renting a bus and driving together. We took our son and daughter there when they were in middle school. It was one of our favorite trips. For Christmas we are going to surprise them! So that is my Thankful list for today. How about you did you link up to Thankful Thursday today? Also linking to . . .
Click here to visit and join the linky. I am Thankful for the Journey . . .
That is a question I can say Yes to. I feel inadequate and I feel like a failure. I wrote about it last week in my Titus Tuesday post. And I had some amazing and sweet emails and facebook messages. Yes I do feel like a failure because memorizing scripture is just a huge challenge to me! I wish this was me. I wish I spent much more time reading my Bible. I really wish I was or I am better at memorizing scripture. But most of the time this is what my Bible looks like. 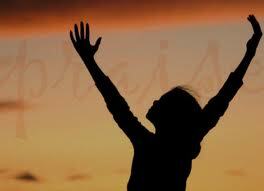 I wish that I could . . .
. . . raise my hands and Praise God that I memorized another verse. But it is a challenge to me. I have been thinking alot about it this week. And the comments and emails I got from friends when I brought the subject up made me even think more. And, I had this idea. I thought wouldn't it be cool if I challenged some bloggers to write about memorizing scripture? And so this is your invitation. Would you could consider writing a guest post? I would love to hear about how you memorize. Or maybe about your challenges. What works for you. And what doesn't. How you feel when you've accomplished memorizing a new scripture. Or how you feel when your like me and you realize it is Monday at the scripture you started last week needs to be repeated again this week. I would love to hear from you. I would love to share your thoughts. Please consider writing a post that I'll share here. Please email me if you would like to join me and share with other ladies on this subject. 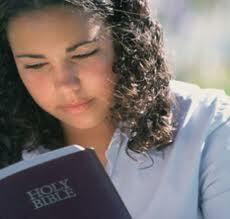 Here's the email Slegan@yahoo.com and please put in the subject line: Scripture Memory. If you know of another blogger that has written a post on the subject please send me the link and I'll send an invite to join us here. I know that we can all encourage each other on this subject. And, for more encouraging posts join the others at Titus Tuesday. Click here. 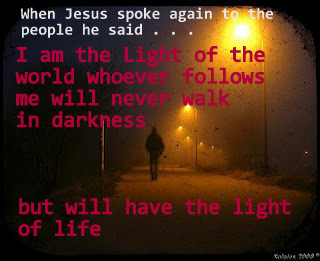 When Jesus spoke again to the people, he said, "I am the light of the world. Whoever believes in me will never walk in darkness, but will have the light of life. " Tonight I wanted to share with you a prayer request from one of the young men at the dention center where we minister. The above phote is of one of my drama teams during one of our practises. One particular song ends with them bowing before the cross. 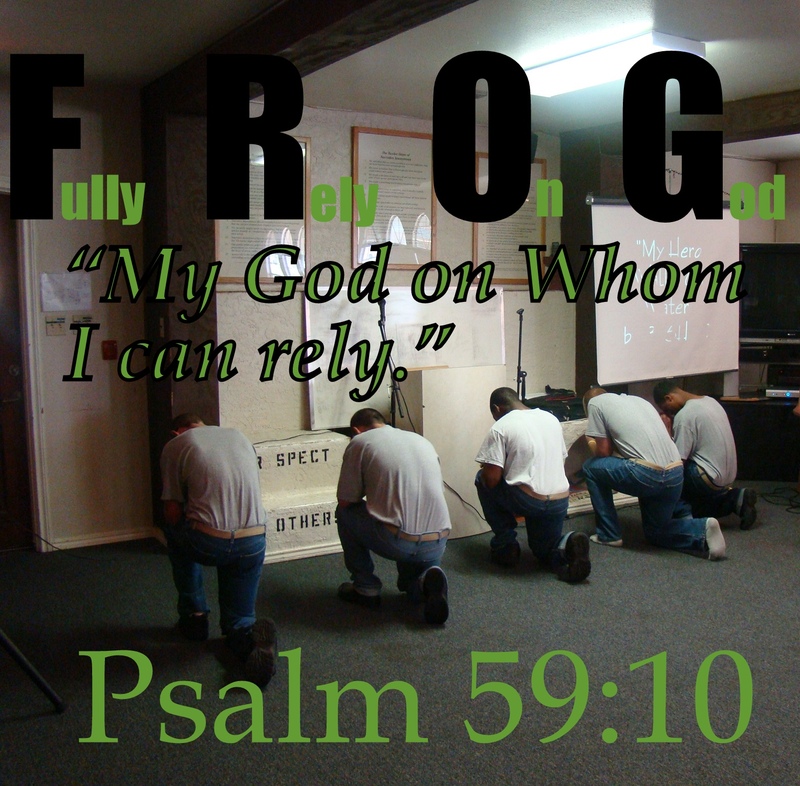 I thought this photo and verse fitted with the following prayer request . . . These words and many others make it worth it all. Even though I am hot and tired tonight. Even though it has been a tough summer. Even though I am having to work so many long hours right now. I am Blessed to be able to minister to these kids on Sunday and on Wednesday. I thank God for the opportunity to be a part of their lives. To be able to share Christ with them and helping them to Fully Rely On God. Loving This Journey . . .
Last Sunday I had about 5 minutes to grab a couple of books at the library. I had nothing to read for the week. I was drawn to the Inspiration section of my library. I tend to enjoy suspense and inspiration. And usually am able to find something in the new release section. I quickly read the back cover. Noticed it took place in Texas and added it to my pile. During the week as I read it there were times that I was glad I picked it up. But for me there were times that I experienced other emotions. Because, it hit way too close to home. The story is about Kate who is the Director and founder of a home for girls called Beacon of Hope. Beacon of Hope is a safe place for young girls that have been caught up in prostitution. Folks even though this is a work of fiction. It's topic is true and is happening, If your a regular reader of my blog you'll know that I have worked with teenagers in trouble for the last 10 years. We have seen many young people that have been through and live in unspeakable situations. 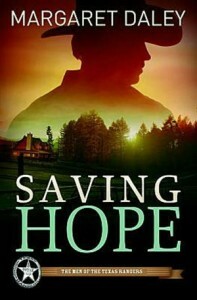 As I read Saving Hope I was touched by the authors accuracy in telling the story. Down to the struggles that Kate faces trying to maintain funding for Beacon of Hope. Miss Daley did an amazing job of focusing on a real problem but also in telling a story that draws you in. I enjoyed the characters. I was kept on the edge of my seat. And I have to say that this story was not predictable. Except that Kate does end up with the Texas Ranger. But the story has twists and turns that kept me interested. Here's a little more about the story from the back cover . . . When a teenager goes missing from the Beacon of Hope School, Texas Ranger Wyatt Sheridan and school director Kate Winslow are forced into a dangerous struggle against a human trafficking organization. But the battle brings dire consequences as Wyatt's daughter is terrorized and Kate is kidnapped. Now it's personal, and Wyatt finds both his faith and investigative skills challenged as he fights to discover the mastermind behind the ring before evil destroys everyone he loves. I visited the authors site and found a link to an excerpt. Click here to go directly there and read part of the story. Miss Daley has definitely found a new fan in this reader. I'll be looking for another chance to read the works of Margaret Daley. I was not asked to write a positive review of Saving Hope. The copy I read was borrowed from my local library. Reading on the Journey . . . Please visit me next Friday for my new feature "Fiction Friday". Each Friday I will write a review/post of a book that I have read during the week. Here's the verse I am memorizing this week . . . Joining JoBeth today for . . . I got JoBeths email alert today about today's assignment. In case you have not visited for 5 Minute Friday here is how it works. JoBeth gives us a topic and we write for exactly (at least we try) 5 minutes about the topic. No over thinking. No analyzing how it sounds. Nothing but spell check. When I read today's topic this morning at 6:30 before I left for work I knew exactly what I would write. I have been waiting all day to get home to write my post. Start . . . . Here I am to worship. Here I am to bow down. 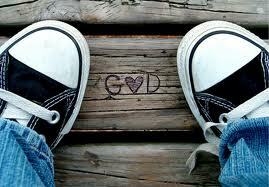 Here I am to say that your my God. Your altogether lovely; all together worthy all together wonderful to me. Do you recognize these words? I have no idea who sings the song but these words just jumped into my mind. And as I pondered them I wish I could say that I worship. I bow down. And I honor God. I try. But so many days I feel like I fall short. I want to worship. I want to bow down. I want to say Here I am use me. I pray that my feeble attempts do please God. I pray that he sees my heart my desire to please Him. I pray that tomorrow I do a better job. That I am able to say Here I am. That I remember that I am Here to worship. I am Here serve. Click Here to join 5 Minute Friday. And here is the Bible verse I am learning this week. On a Journey to Worship . . .
Today I am Thankful that . . .
. . . Our family had 23 years with Pal. And that my grandson got to ride and enjoy him. It was very, very sad for all of us last week when we lost him. We are thankful that we had many years and many memories. Pal spent the last 2 years living at a Children's Home and even became a therapy hose for disabled children. I am also thankful that . . . I get to punch a time clock. 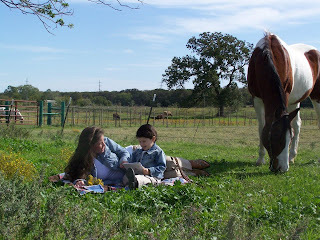 Cowboy and I made the decision in the early spring that I would need to get a full-time job. I spent a little over a month looking. 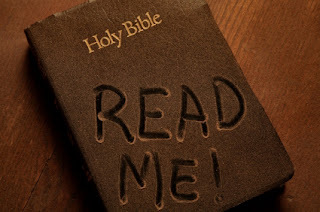 I became a little anxious and really had to lean on scripture and trust God. I really wanted to find a job by August. I started on July 25th! Thank you God for directing me to the right job. Cowboy and I are both very thankful for Pal and for my job but we are really, really thankful for . . .
. . . a swimming pool! The pool in our apartment doesn't look like this (isn't this a cool pool?) 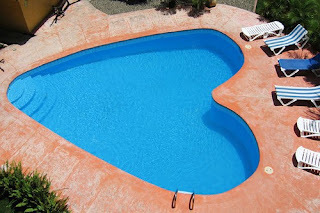 But it is full of beautiful cool water. It feels great in this 105 plus weather. And we're thankful for . . .
We are thankful that God directed us to find this amazing Christian artist. We just stumbled onto his first video on YouTube 3 years ago. Yesterday B-shoc's mom posted a photo on facebook congratulating him on 3 years of ministry. If you have teenagers direct them to B-shoc.com he is an amazing artist and has a heart dedicated to sharing the gospel. He encourages use of his videos and puts lots of videos on You Tube. B-shoc has been very encouraging to us and has sent video 'shout outs' to us to use on Sunday at our chapel services. Thank you God for B-Shoc. And I am thankful for friends I have met through blogging. I am thankful for my old friends and new and friends I'll be meeting. I love meeting other bloggers. 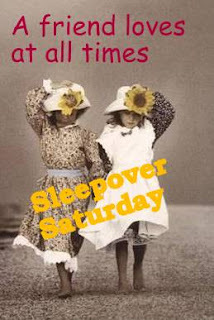 This Saturday will be my second Sleepover post. Come by and meet one of my friends. And, one last thing. I am thankful that God is patient with me. I really am trying hard to memorize scripture. Update on this weeks verse. I have mentioned before that the hardest part for me in memorizing is remembering the reference. Well this week I seem to remember it better than the verse! Do you memorize verses? What method do you use? Journeying with Jesus . . .
what Christ did for me. Today I am sharing the verse that I am working on this week. I am challenging myself to really work hard on memorizing scripture and hiding God's word in my heart. Or at least filling my heart with God's word. I really don't want to hide it. I want to share it with you! I am linking with Word Filled Wednesday . 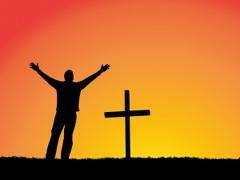 . .
WFW is a love offering to Christ. Our art, our photography, our verses, our prayers. WFW is a way of remembering HIS word. IT’S ALL ABOUT HIM. For more great illustrations of God's word visit the linky. Blessed to be on the Journey . . .